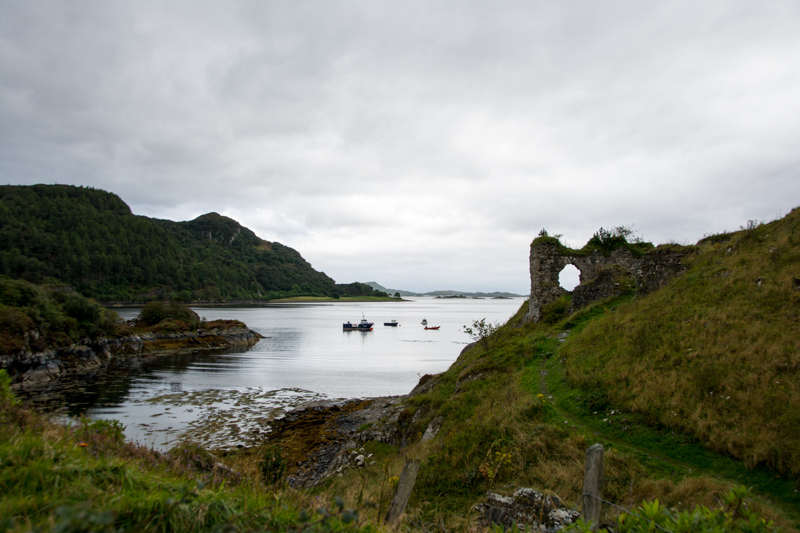 Scotland: Lochs, castles and pubs. Cal November 27, 2016 November 27, 2016 Comments Off on Scotland: Lochs, castles and pubs. To get to Scotland we had to take the ferry from IJmuiden to Newcastle. The trip is pretty long so we had our own cabin with bunk beds to spend the night. The boat was pretty full. Mainly with older folks. Some of them were with a bike. Midlife crisis maybe? The boat had a lot of entertainment including nice restaurants and bars to eat and drink. It was a bit on the pricey side though. In some places you could gamble and others you could even listen to live music. There was even a cover band on board. After too many drinks HW and I went to our bunk beds. After a quick large coffee on the ferry, we arrived in Newcastle. Since we were not planning to stay in Newcastle we drove straight out of town to visit some Hadrian Wall sites. We started first at Heddon-on-the-wall which is marked as the non-official ending of the Hadrian Wall trail. We could not find any pieces of the wall there so we drove further to Cawfields Quarry part where we had a nice stroll alongside the wall. We did a quick lunch in a nearby pub. The cook thought we were the Proclaimers! 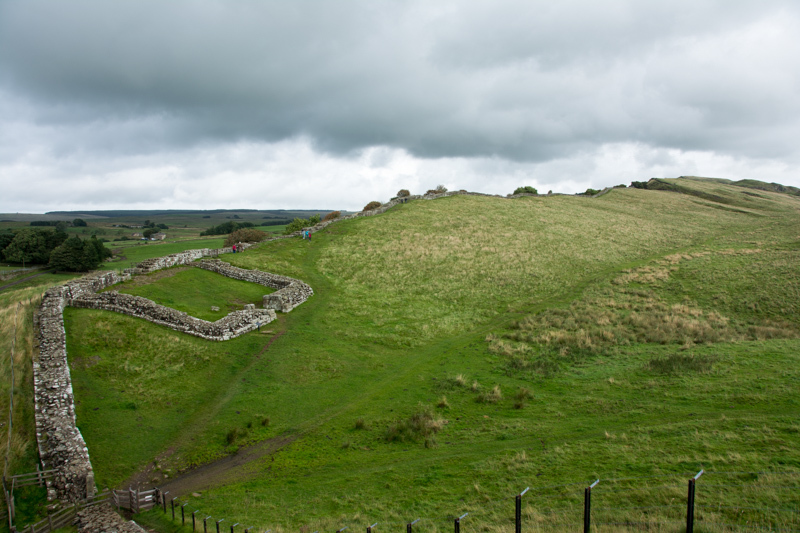 With a full stomach we drove to Birdoswald Roman fort where the outlines of the fort were still visible. There were also preparations for some kind of medieval fair. The first tents and people in medieval clothes were already gathering. After the visit we drove further to Lanecroste Priory which was a ruin were a part was restored for a still active church. Then it was time to pass the border to Scotland. We drove the tourist route to Ayr where we walked on a beach to a small tower ruin. We finished our drive in Glasgow in the evening. We found a nice pub next door for some late pizza and beer. This day we wanted to spend the whole day in Glasgow. Since we had no idea where we were staying that night we decided to take our car to town. After parking the car and taking a train we arrived downtown for a nice walk. We saw some nice squares, buildings and graffiti. The walk ended at the very old cathedral. A beautiful building with lots of nooks and crannies with more chapels. Then we walked to the Necropolis next to the cathedral. This town of dead hosted a lot of old tombs, graves and small mausoleums. Some were better preserved than others. Back in the center we found a nice pub for lunch. After lunch we walked for a bit in town and we took the subway to a park to see a nice riverside with the auditorium and other buildings. We also saw preparations for some kind of wheeler round. Our Dutch Lotto/Jumbo team was present as well. Next up was catching some Pokemons in the park. We saw quite some people playing the game. Fun to see it was also a thing here in Scotland a well. 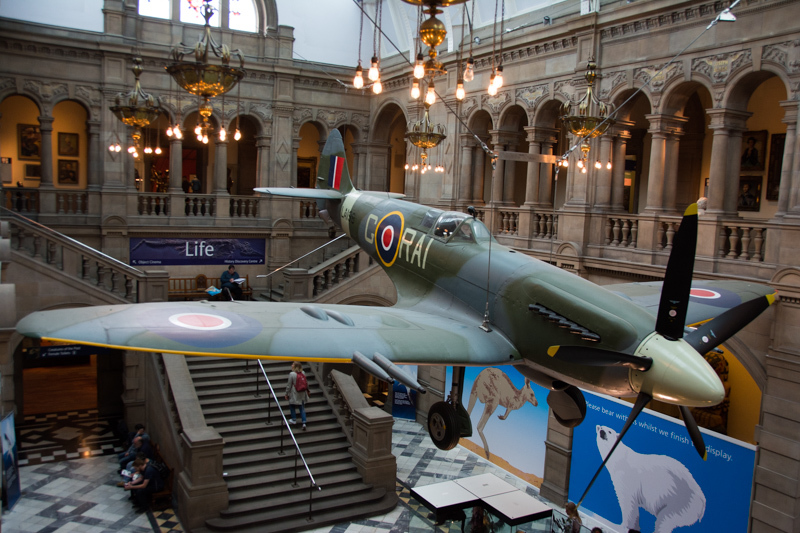 Fun fact is that the Kelvingrove Art Gallery and Museum had three pokestops, so a good reason for a visit. So we went in and saw a nice Rembrandt, a real Spitfire, ancient Egypt artifacts and other cool stuff. After being cultural enlightened, we went back by public transport to our car. We decided to go back to the same hotel. We picked up some sandwiches in a store for a quick dinner and went back to the same pub as last night. After a full English breakfast at the hotel buffet we left Glasgow for Loch Lomond. After a visit to the visit center we went off for a nice hike to Conic Hill. After a nice climb we made it to the top for a nice view over the loch. When we walked back we found a nice spot at the lake for some lunch. Hendrik brought hot dogs and buns from home. So we were in for a great lunch. After lunch we drove to Aberfoyle. We heard there were some nice walks. It started to rain so we had to take our umbrellas for the first part of the walk. We walked to a nice water fall and finished the trail through the forest. After a quick bite we left for Oban using the scenic route. We had some very nice views like a castle on an island in a lake. In Oban we went on a sort of pub crawl. We ate and drank at one, saw Scotland win in soccer in the other and helped the locals in a pub quiz in the last one. 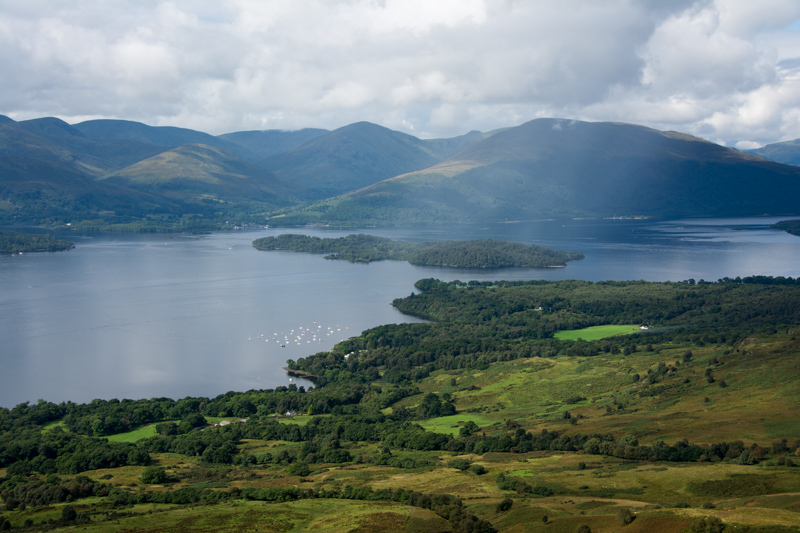 View from Conic Hill over Lock Lomond. The day started with a small disappointment. We wanted to take the Ferry to the Isle of Mull. But sadly the ferry was already overbooked. So we decided for plan B: The Oban Distillery for a nice tour! The distillery was quite interesting. 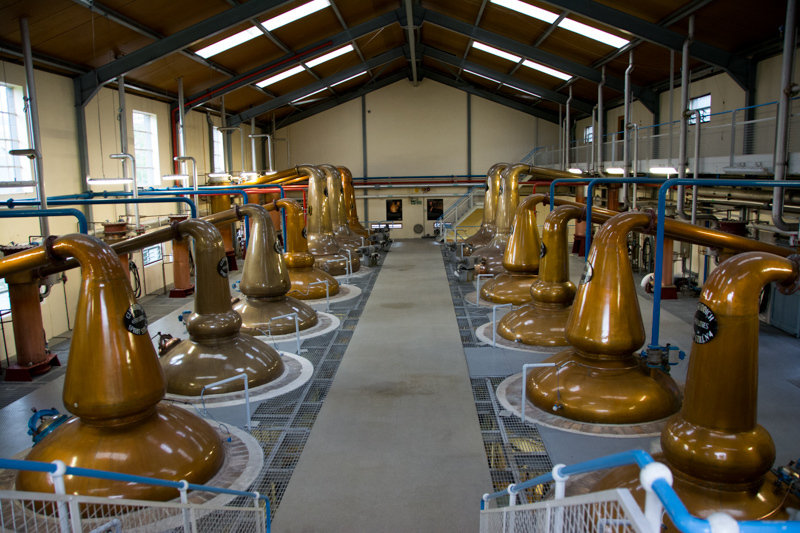 It gave us a nice overview how whisky is being made. The tour guide was fun and even let us taste a small sample of a cask strength whisky that they were not even selling. Before we could drive again, we first went for a coffee with Scottish scones with clotted cream. These were very good! 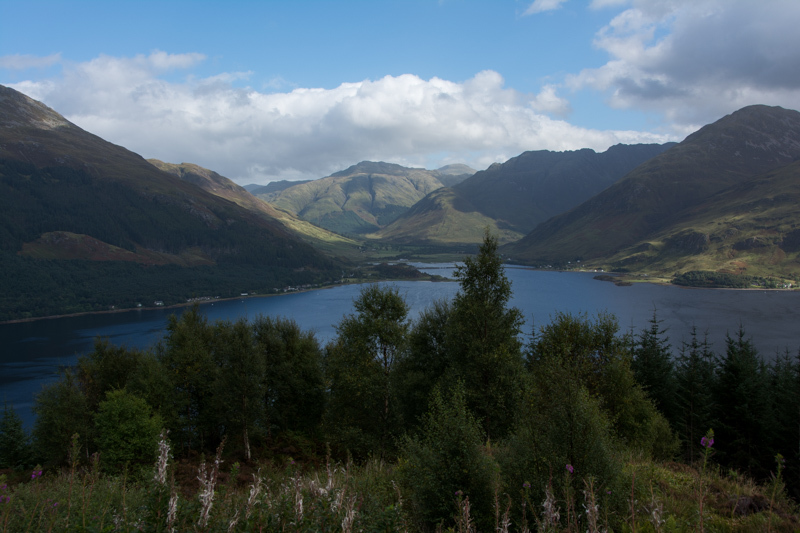 With the stomach full we went for a drive to the Glencoe area. We did a small and boring walk near the visitor center. The drive through the valley after that was a better. We finished the afternoon with another walk above Glencoe. We had found a nice pub to sleep in Roy Bridge where we spent the night with the locals. Sadly we also were looking very hard to find a place to sleep on the Isle of Skye including making phone calls on a parking lot for 45 minutes. It was the only place in the village where we had phone service. After the calling session I found a B & B on Skye. It was only in the weekend, several days ahead and not for the next day. Changes of our schedule needed to be made. 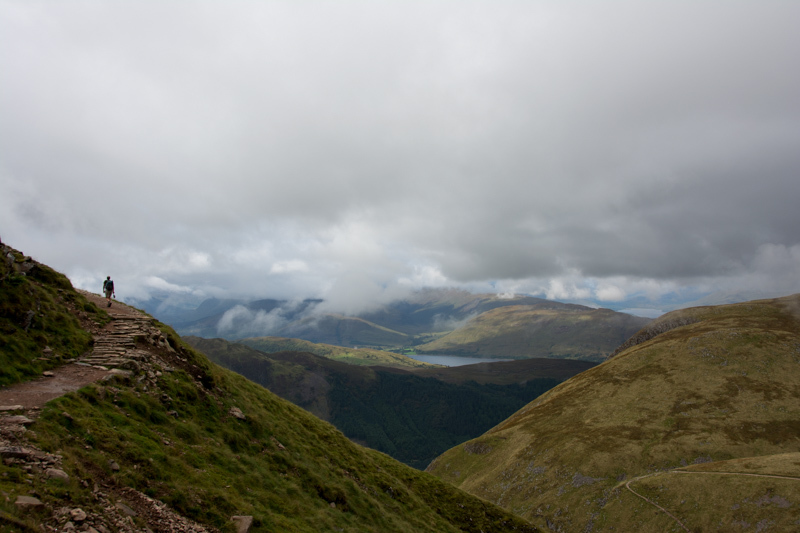 After a good breakfast we decided to take a peek at the highest mountain of the UK: Ben Nevis. We talked to a ranger and she told us the best for us to do is just to the waterfall that marks the halfway point. After a nice and relatively steep climb we made it to the waterfall. There we came to the conclusion we still had some strength in our legs left to try to finish the climb. The trail became a bit more challenging in the second part. The path became rockier and we started to walk into the clouds making it colder but also vision became a problem. Because of the fog it was hard to see through our glasses. Using the maps.me app and GPS as a reference we could keep track of how far it still would be to the summit. After almost 4 hours we reached the top! As a reward we got coldness, fog and wind. And sadly most of all: no vision. But it was still great to be on the summit. We even found a geocache at the summit. What you walk up, you also have to come down. It was very noticeable that the trail was in a bad state. You really have to look were you were placing your feet. After three hours we finally came back on the parking lot where we treated ourselves with hotdogs. Since the Isle of Skye was not an option we drove to a Biker’s B & B in Cohon Bridge. Our host was so kind to phone the hotel at the end of the road to make sure the kitchen was still open. When we arrived they were already prepared for our arrival. Those beers were well deserved after this long day of hiking and driving. We started the day with the usual Scottish breakfast. Since finding accommodation is a problem from time to time we decided to find one before we left. After some calls we found a nice one that was even 13 pounds cheaper by phoning them directly instead of using booking.com! Where we saved money we lost it straight away by finding the most expensive gas station during our whole holiday. It was time to check the surroundings near Loch Ness, we drove very touristically to Dog Falls by driving the wrong way. It delivered nice photos though. The walk near Dog Falls was a bit dull at the start, but went better halfway. 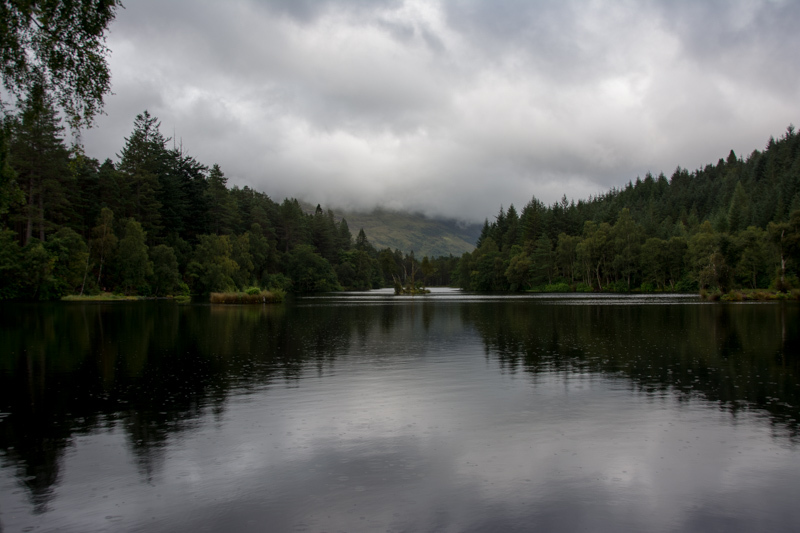 On route was also a nice small loch with a steep climb to it. When we finally arrived at Dog Falls there were a bit disappointing. Next stop was Drumnadrochit where the Loch Ness exhibition is. It was pretty nice, going from small room to small room telling the whole story about the monster. After the exhibition we went for some Chicken and chips with a monster of Loch Ness beer. 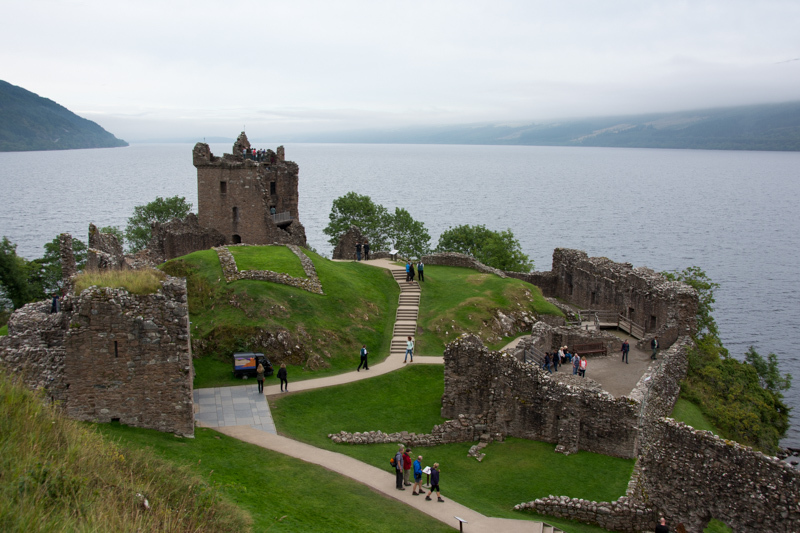 After the late lunch we went to visit Urquhart castle. It was a nice ruin. The movie at the start was awesome with the curtain opening at the end showing the ruin itself. We bought an explorer pass here so we could visit much more Castles and stuff without buying additional tickets. It was an interesting castle to look at. Especially in combination with a view over Loch Ness. After the visit it was getting late so we started our long drive to Portsoy. The road was very frustrating with all the roundabouts and slow trucks. The hotel was pretty nice. It had an Indian food restaurant. Finally a day that did not start with Scottish breakfast! I had nice scrambled eggs. We drove all the way to Portsoy to sleep. I did not want to leave right away. That sounded a bit weird to me. So we used a geocache location as a nice excuse for a walk along the coast line. When we returned to the car we drove to the Glenfiddich Distillery. We had to wait for our tour slot. Enough time for a quick geocache near the parking lot and and a quick lunch in the Glenfiddich lounge. The tour itself was pretty nice. Of course Glenfiddich is bigger than Oban, but they still use the same method. They only have more of it. Our guide had nice stories. I also had Glenfiddich stories as well. This was rewarded by an extra glass during the tasting session. Next to the distillery was a Balvenie Castle. Since we now can visit those for free we had a nice stroll through the ruins. Before leaving for the next site we went back to Glenfiddich for a nice IPA whiskey that was so new that a bottle needed to be retrieved from the gift shop. The next site was Corgaff castle: a small castle that was restored to its former glory when it was in state hands in the 60s. We ended up in our hotel in Dinnet. The front desk guy asked us if we wanted to eat dinner here and we responded positive on that. We did not know that the restaurant was pretty fancy and expensive. According to TripAdvisor it was the only one in the neighborhood so we enjoyed a nice meal that was different than usual pub food! After dinner we went for two caches that were in the neighborhood. One was even on the property of the hotel! Making it the total of 4 caches found today. After some relaxing with beer in the lobby we went back to our hotel room with crappy internet. After a very nice breakfast we did two quick geocaches. One was a nice one near Loch Kinord next to our hotel. 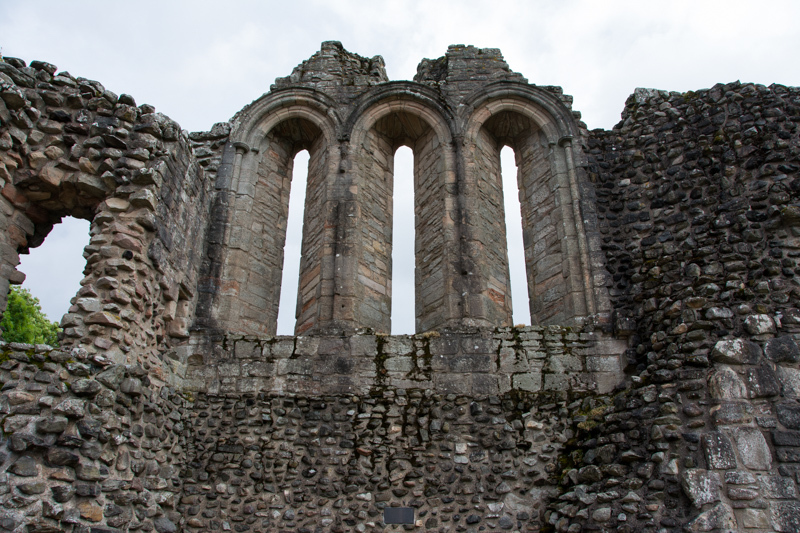 We stepped in our car for a drive back to Kildrummy castle. This was a very nice ruin. Sadly people were mowing the grass with very loud machines. But still a nice visit nonetheless. After the visit we wanted to see a castle that was still intact. Apparently Balmoral Castle is the winter castle of the Queen so that one was closed. We drove back to Cairngorn National Park. Where we did some sightseeing near Aviemore which is very popular place for tourists. We were definitely not alone there. We visited Loch Morlich near Glenmore and did a nice short trail with geocache near Feshiebridge. After the trail we arrived in our hotel in Kingussie. We had a nice dinner which luckily for us was back in the old price range. After beer and whiskies we returned to our room to kill all the darn midges that had invaded our room. Today was the day where we were finally welcome in our B&B on the Isle of Skye. We drove very touristically to a ferry point instead of the normal big bridge. Before we arrived at the ferry we found a very beautiful inn for a nice lunch. The inn looked old with local friendly people and good food. With a full stomach we arrived at the small ferry. It looked like the ferry was run by a family. Arrived on the isle we drove to Castle Armadale. On the terrain was also a museum of the MacDonalds clan. It started nice with an audio tour but became boring pretty fast. The castle itself was more a ruin of a mansion than of a castle and not that great. We could not go in it either. We drove to our awesome B & B with a very friendly host, a good room and a very nice view. We tried to find dinner in Portree but all the restaurants and pubs were full. We chatted with a Dutch couple in a pub, while we waited for our table to become available. After a rushed dinner we just sat down in another pub with live music and more foreign people to talk to. 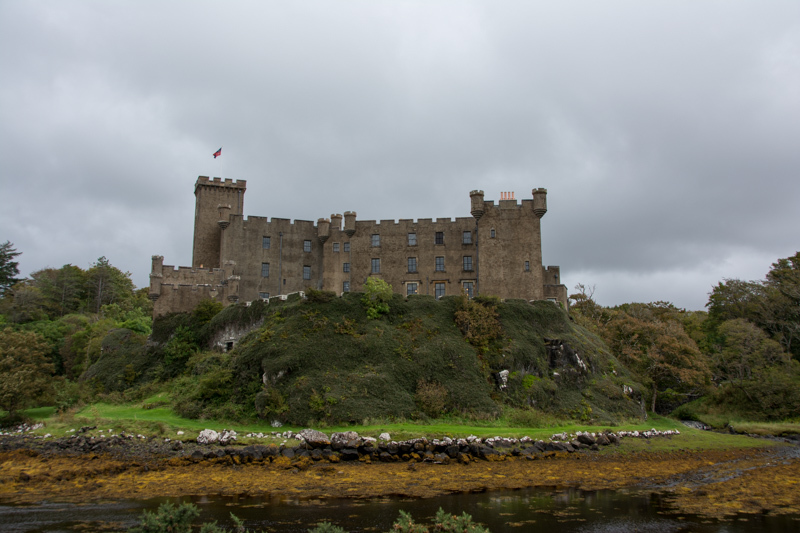 First thing we did was to drive to a still in use Dunvegan Castle. It was pretty nice with a lot of history about the clan MacLeod. The gardens were nice as well. After the visit we went for some geocaching at Coral Beach. This was a weird beach because it was not sand but just dead coral. It was not known to us how the coral got there. Then it was time for some more whiskey. We went to Talisker for a tour. Since we had to wait 50 minutes we made lunch in the parking lot. The tour itself was okayish. The other two were better! At the end of the tour we could taste a Talisker Storm whiskey. It was very appropriate because it started to storm outside. The weather was so bad that the only thing we could do was just to drive over the island. Back in Portree we shopped some beers. Because we were early we could get a dinner easily. After a stop at the bank we drove back to the B & B for a relaxing evening in our room. The storms continued the whole night. After another nice breakfast in our B&B we said goodbye to our host Mary. We started our touristic drive to our B&B at the other side of Scotland. After leaving the isle we drove along the coastline over a beautiful pass. It was so windy that the water falls even streamed upwards. Back down we ate lunch in a very busy pub in Applecross. We continued our drive further along the coast until we hit the big road to Inverness. We finished our drive to Ardersier to our B&B. We went for some drinks and dinner in a local pub that was empty when we arrived. After a nice breakfast we started another “Explorer pass” day. Fort George was literally around the corner. It is a huge fort that the army still uses. It highlighted the “highlanders”: a military division consisting of Scots. It took quite a while to explore the whole fort that was open to us. When we were leaving to the next attraction we heard in the news that the government wanted to shut Fort George down as a military base. How fitting. 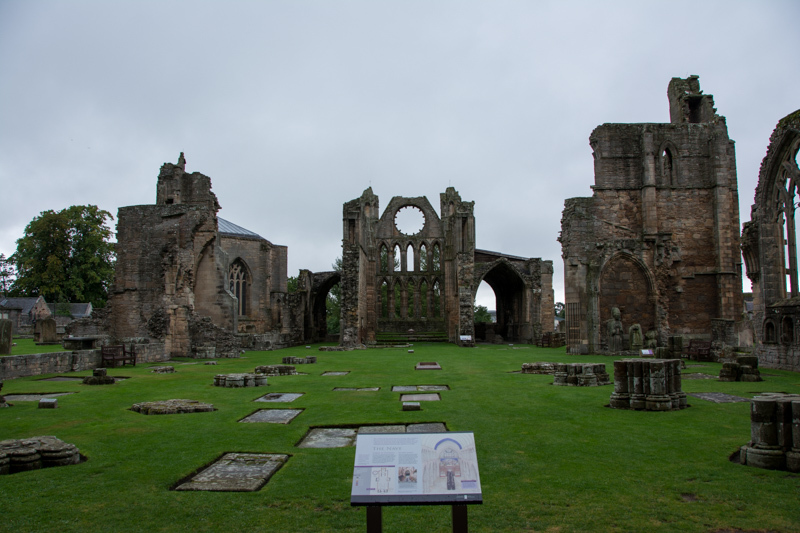 Next stop was Elgin Cathedral. We saw this site a couple of days ago on pictures so it was time to visit it for real. A ruin of a Cathedral was quite impressive. There were still a lot of things to see. Also still a lot of graves were added within the cathedral walls after it was destroyed. You could still climb the towers for a nice view. After a quick lunch in the local mall we left for the next attraction: Huntly Castle. This castle was a bit more than a ruin. A part of the castle was still standing, so you could walk in that part and see some of the old rooms. After this nice attraction we left for Dundee. The navigation gave us a nice scenic route over some very small roads. We arrived at a pretty cheap, but decent motel-like inn. It had very good food and nice drinks. The day started with a nice chat with the owner of the inn during breakfast. Our first stop was Edzell Castle which was a nice ruin with a nice well preserved garden. The next stop was something different. We visited Aberlemno Sculptured Stones, these early medieval stones contained some nice carvings. 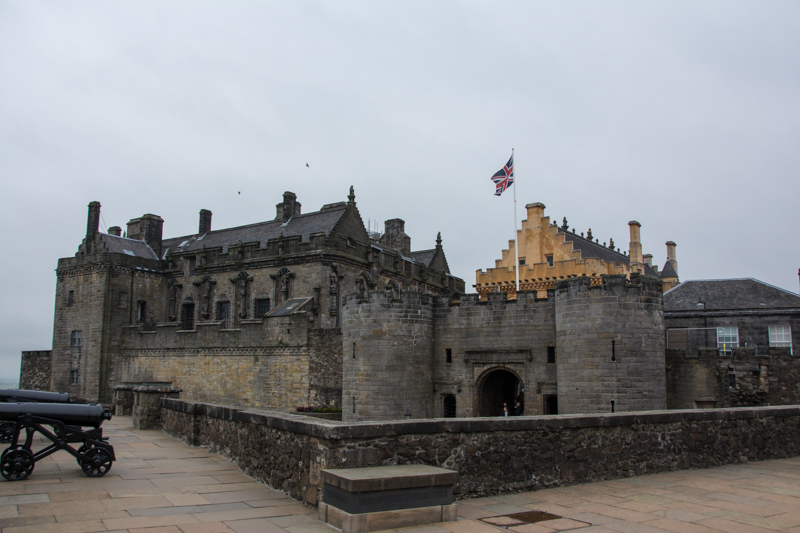 Then we left for the main attraction of the day: Stirling Castle which was very big and very impressive. We stayed there for almost three hours, to see all the rooms and all the things outside. Some rooms were pretty well reconstructed. Afterwards we drove to Edinburgh, which was quite a challenge because the TomTom let us to very weird and busy places downtown Edinburgh. After our hotel visit we went to downtown for food and drinks by bus. We found a nice American restaurant for some food and a nice sports pub for some drinks. After breakfast we left with the bus to the city center. We started the day by walking a part of the royal mile to the castle. We could skip the queue with our explorer pass and enjoy the lower parts of the castle. Our estimate was that you have to wait more than an hour to get your tickets. Which we could skip. There were some museums at the lower part showing a lot of military might and war during the ages. After the museum visit we were thirsty so we went for a cup of coffee. We did not get coffee. We got an “Americano” which is an espresso poured in hot water. At 1 PM we were on time for the One o’clock gun. 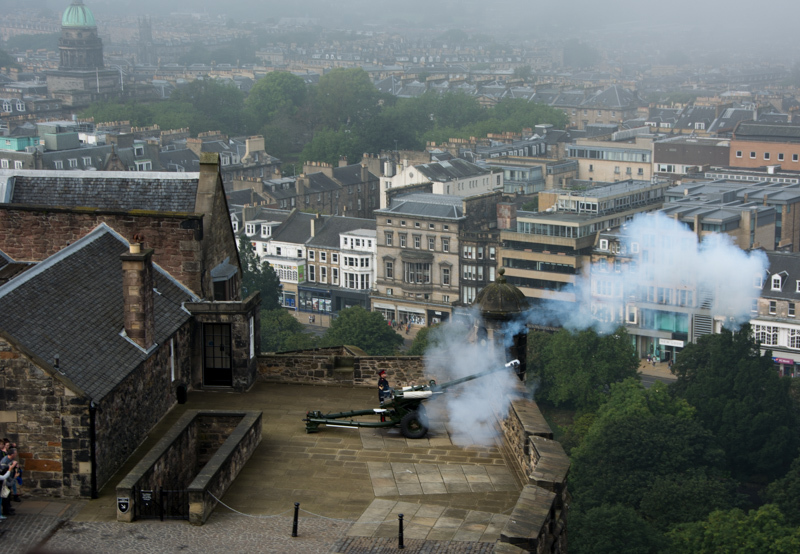 This large canon is fired at exactly 1 PM so that people could synchronize their clocks. After we got the ring out of our ears we enjoyed the rest of the castle. Which took us a couple of hours. Back down we went straight for the first pub for a beer. I remember a high tower when I was in Edinburgh years ago. I wanted to see it again. Apparently it is the Scott Monument.This time I have a better picture of it. After a quick bio break in the nearby mall we finished the rest of the Royal Mile. At the end are the government buildings. Not much to see for us there. It was time for another beer. We drank it at “The Word’s End” pub. Because our stomachs were growling we decided to try to get something to eat at the “Brew Dog” pub! Sadly no tables were available so we had to settle for just a beer. We ended the evening in a nice Italian chain restaurant for some pizza and bad Italian beer before heading back to the hotel. Today was the day to head back to home. After our last Scottish breakfast we left for our ferry in Newcastle. Of course we drove with a detour using our explorer pass. Smailholm tower was the first on our list. It was still in good condition. To get to the tower we had to pass the property of a local farmer. 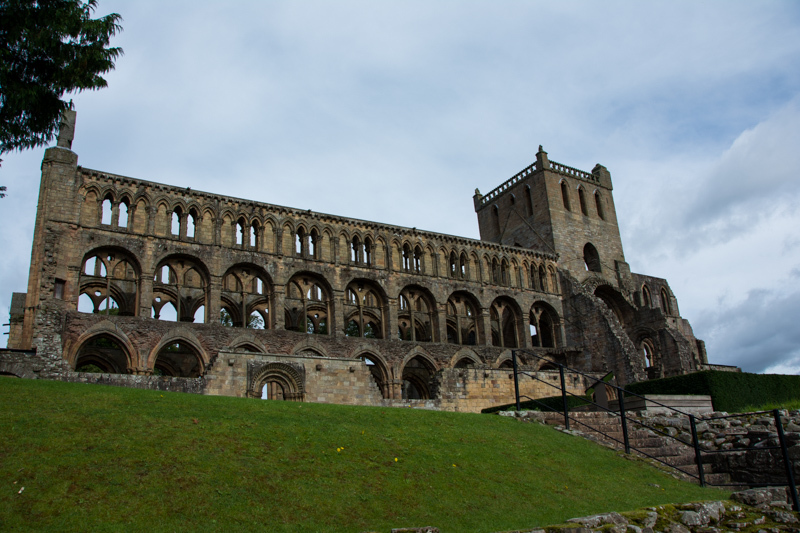 Our last stop was Jedburgh Abbey which was a ruin but a lot of parts were still intact making it a very weird experience. After getting some quick sandwiches at a gas station we finally drove to the ferry. While waiting on deck before leaving the harbor we had quite a view of a line of sport cars that also were joining us on board. During our trip we spend way too much money on dinner. We spend the rest of the evening in the night club with drunk English people on a mini cruise listening to a cover band and playing bingo. A good ending of a great holiday!